My second post is up at BlogAdda. After a basic checklist of blog essentials, I talk about the importance of making your content accessible and lay out some of the most basic (but crucial) ways to do so. I just saw a tweet from someone asking if this wasn’t too 2005. My answer, is, yes, perhaps. On the other hand, a staggering number of bloggers don’t know how to promote their blogs, are unaware of what a feed is and are completely in the dark about the fact that they might be missing out on the readership they deserve, simply because they are not accessible. I know this because I’ve built my blogging activities, HTML piece by HTML piece. I made mistakes and I learnt. I still get a number of friends asking me about these so-called common knowledge questions which made me ask whether these things really were as common as people thought. I think what a lot of technology-savvy people sometimes forget is that blogging is not a technological activity. It is a social one like email, even a creative one like writing. Technology is the medium and not the focus of it. It draws people from different backgrounds and interests. There are as many kinds of bloggers as there are people. And the skills they require to establish their unique presence are all varied. Keeping up with internet trends is not on everyone’s list of priorities. In my posts, I aim to touch on blogging aspects that are universal enough to be relevant to all kinds of bloggers – personal bloggers, food bloggers, photo-bloggers, professional bloggers and technology bloggers. But my approach is a layperson’s point of view, the one of someone who has never been (and still is not) passionate about technology but manages to keep up (just about) with what is immediately useful. The BlogAdda team and I have a list of such topics in mind but if you have a suggestion, please do drop in a comment either here or at BlogAdda. I hope you enjoy the post! A feed is the most crucial way to distribute a blog’s content. Remember the times of yore? People built their dwellings and families. Then they started to communicate with each other. They probably went over to each other’s houses for news and discussion. The online equivalent of that is visiting blogs by typing in their URLs. Then postal services were set up, that allowed people to receive communication at their doorstep. Email of course, is the internet’s answer to that. Remember P.O. boxes that allowed you to receive communication at a designated box at the post office where you could pick up your mail when you liked? A feed-reader is the online equivalent of just that. People use the internet in different ways. If you have a blog, you’ve already established an address online where people can drop in to read your posts. A feed allows you to also deliver the posts to email addresses or to a feedreader. Most of the free blogging service providers like Blogger and WordPress already provide you with feeds for the URLs that you register. You can also ‘burn’ a feed at Feedburner which, incidentally, is a Google product so you can login with your account. 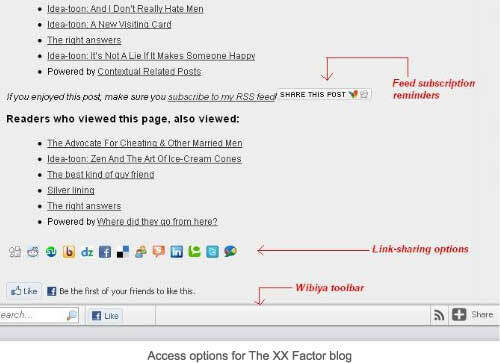 Feeds also allow other sites/blogs to display updates of your site, which can only be good for the extra visibility. Here’s how a feed-reader works. You enter the URL that you wish to track. The feedreader will search for all the available feeds relating to that site and come back with a list of options. You can then subscribe to the feed. After that, all new posts will be visible on your feedreader once they’re published. There are a number of feed-readers available. Bloglines is one of the older services but it often faces downtime. Google Reader is one of the most popular feedreaders. Being a Google product, it is automatically available to all users of a Google product. It also allows you to share recommendations with other people in your address book. Facebook Notes feature also allows you to subscribe to a feed and publish the posts there. Feedburner or Quick Subscribe allow your visitors to have your new posts delivered to their mailboxes as soon as they’re published. Friendfeed lets you collate all your online content (multiple blogs, videos, photographs, tweets) into a one-subscription stop for your readers. After accessibility, allowing quick sharing is the next step. Make it easy for your visitors to not just receive your content but also share it. The internet is the information superhighway after all, making it very easy to pass a link, a picture or text along. In such an age, many bloggers lose out simply because sharing their link is too tedious a process. How can you make it as simple as one click? Twitter, the hottest trend on social media allows you to share a link each time you post, thus reminding all your followers to drop into your blog. Digg, Reddit, StumbleUpon and Delicious are some of the popular link-sharing services. Tell a Friend allows you to add a toolbar to your blog that gives readers a wide variety of options with which to share a post link with their friends. Light Social is a plug-in that does the same thing for WordPress blogs. Wibiya adds a toolbar to the bottom of your blog and lets you track the times your blog’s links are shared, pull content from other sites and collate your tweets. Make your blog friendly & accessible. Happy posting and happy sharing! I’ll see you around on the blogosphere!